What Church Really Is – A Consecrated Building But, Most Importantly, Consecrated People! This post was written by Gregory Minetola, a member of St. Joachim Parish and Keep the Faith in Frankford! Recently, Joe Taylor and I had a meeting with Fr. Higgins, Pastor of Holy Innocents and Dean of Deanery 12, Lower Northeast Philadelphia, and Joe Paesani, Business Manager. I would not want to comment on the specifics yet I will tell you that it was an open dialogue full of passion and principles on both sides. As I have reflected and prayed on that meeting, a few ideas keep playing in my mind. The first thing that I have not be able to get past is the idea that they really think there is a Catholic Church in Frankford. When I made the statement there is not a Catholic Church in Frankford I was looked at in disbelief. Joe Paesani stated, “There is a Catholic Church in Frankford, it’s Holy Innocents.” Yes, Holy Innocents does share part of the 19124 zip code yet, we, in Philadelphia, are strongly defined by our neighborhoods. Not only is it where we live, it is where we have loyalty. Some, especially Archbishop Chaput do not understand that because, especially, in his case since he has been in Philadelphia he knows the stats but really doesn’t know his people or the connections we, as Philadelphians, have. In a lecture at St Charles Seminary in Oct 2013 during the Q&A at the end of the lecture he alluded to the fact that Philadelphians often introduce themselves by which parish they are in. He stated no where else do they do this. That is right! We are deeply connected to our neighborhood and the parishes in them. There is a disconnect with our Archbishop. If you look at his public calendar he is very often somewhere else in the country or in the world other than truly leading his flock. If he was here long enough to learn about our neighborhoods he would learn that Juniata is 1.025 sq miles with 23,000 people to Frankford’s 2.6 sq miles with 56,000 people. The question arises, How can one parish serve so much area effectively and with no one falling through the cracks? It was interesting on their understanding of why we have an active appeal. They think it is only about the building. To a certain extent it is. It is our Church! 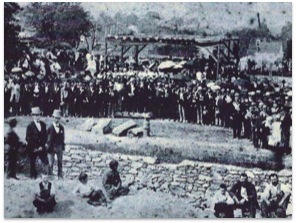 In 1843, 20 people meet in a small home to consult and devise plans to build a Catholic chapel. They knew the people in the area needed it. Our ancestors saved, built and sacrificed during the depression for much needed renovations, scraped to send their children to Catholic School and volunteered to do things to make up the difference of what they could not contribute. They were doing it for their faith community. The understanding was that this was our Church with ties to the Archdiocese and in turn Rome. Well, one would say we have been baited and switched. A little known fact is that The Bishops changed that and put our churches “in trust” for the people. Then, years later the Archdiocese of Philadelphia creates “the PPA process”, which is copied around the country. Then, in our wave of parishes under study with little conversation with the people and very hush-hush meetings, it is decided that St. Joachim and Mater Dolorosa, which St. Joachim helped to establish for the Italian immigrants of Frankford, will close and in one document by the Archbishop dissolve and suppress 172+years of history, honor, tradition and leave the community with no church to worship in. Wait, didn’t we build and maintain it? Why have they decided our fate? Church is not about numbers. Where two or more gather in his name! So it is about the building even though it is the third St. Joachim Church. It is our ancestor’s legacy and what they left for us – a comforting place where we can meet socially and spiritually. Our Church is an inheritance from our grandmothers and grandfathers, mothers and fathers. How would you feel if after you parents died your childhood home was taken with no one asking?!! This is what has happened, Our church has been taken! Fr Higgins and Joe made it clear that without the rental income from the school, we could not have been able to operate the parish.Those properties, too, are our ancestor’s legacy as well. The rental income fact may be true but we did not decide. Pope Francis has called for a smaller church overall that reaches out to those in need. Should we have been the ones to decide our fate? Maybe a storefront church on Frankford Ave. Maybe we sold one or two of those properties? We were not given the chance, it was decided for us. When St. Joachim closed, in one of my letters to the Archbishop, I asked where all of the rental income from the school & convent building went. He,or someone writing for him, stated it stays in the parish. 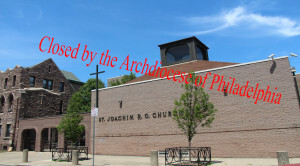 Since St. Joachim Church was closed in June 2013, the parish of Holy Innocents has realized $600,000 plus in revenue from the school alone not counting the convent. What the Archdiocese doesn’t realize many people know is that parishes are required to keep a certain percentage of their funds in a Archdiocesan account that the Archdiocese borrows on and makes investments with. Then there is the fact that Fr Higgins is the Dean of our Deanery and pastor of the merged parish. Is this conflict of interest? As he has said many times “I thought there should be a Catholic Church in Frankford, but the Archdiocese didn’t think there should be”. Why would he say that if he didn’t feel it was right or if he thought our Church could not be supported? One would thinks as the Dean he would say “I think there should be a Catholic Church in Frankford and I am going to fight for one”. 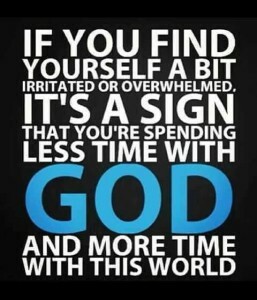 This is about obedience. The Archbishop likes to used this word especially with initial contact with us. The clergy with important positions know they have to be obedient to look good in front of their boss and keep those positions of power, potentially even move up. In 2011 now retired Msgr. Rodgers who was the mastermind behind the PPA process said “The role of the Deans is to offer a better means of communication between the Archbishop, the priest and the people”. This quote is very telling. We are told what to do from communication handed down from our Archbishop never having a chance to participate in this process or in communication with the Dean and then Archbishop. This is the PPA process in a nutshell. I was told to my face in this meeting that “There are very few Catholics in Frankford”, that “The Parish was on life support”, that “There will be no cooperation or collaboration as long as there is an active appeal”, that “We are not going to have people look over our shoulders” , that “Lots of time and money has been wasted on this appeal”, and “Don’t continue”. Well, our ancestor’s legacy, our history, our spiritual life and our neighborhood is too important to not continue. 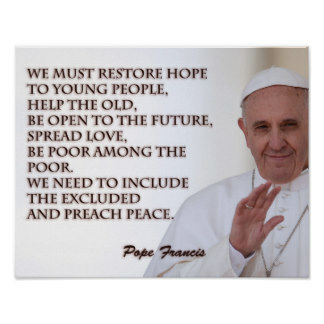 From Pope Francis to the “Dear Lay Faithful”! Today, on the Feast of the Baptism of Our Lord, the Pope announced the newest Cardinals that he will install on February 22, 2014. You can read about it here, “The Scarlet is Served – Pope Reveals 19 New Cardinals”. If you have been “cardinal watching”, you know that it was speculated that there would be no new American cardinals. Our own Archbishop Chaput and Archbishop Jose Gomez of Los Angeles were thought to be under consideration. However, their predecessors, Cardinal Rigali and Cardinal Mahony, respectively, were still under the age of 80 and it is unusual to have 2 Cardinals within the same diocese. Well, we can take heart in Pope Francis’s words to us, “Dear Lay Faithful, be close to your priests with affection and with your prayers, that they may always be shepherds according to God’s heart.” We believe strongly that we must, each of us, take charge of our faith and be living witnesses to all we meet and to expect that we share in the priesthood of our clergy as well through our Baptism. (Today is, after all, the Baptism of our Lord that we celebrate.) That is our call to continue to reach out to all with the “Good News”, the joy of being Catholic. We have heard the Archbishop refer to himself as a manager. 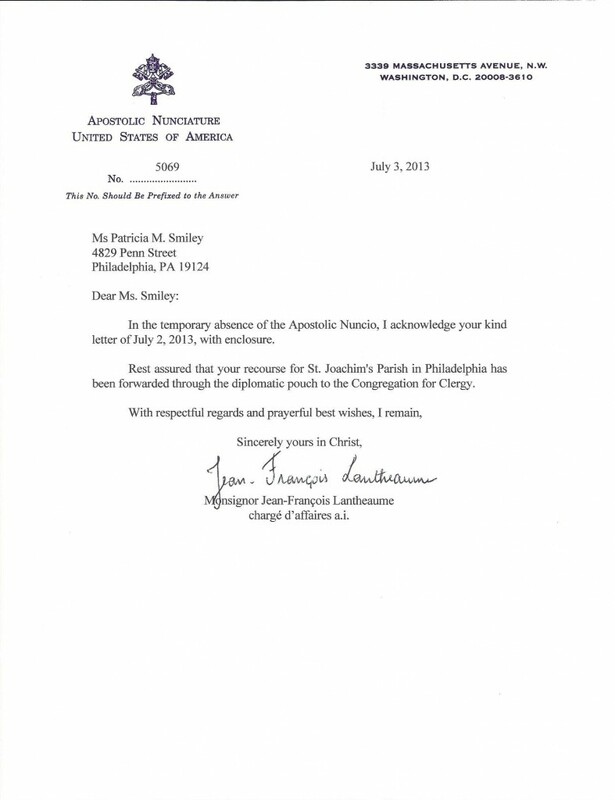 We have tried to thank the Archbishop. Even after he told me, at one of his Sunday night Masses, (and I was being pushed along by his security) that this was not the time or place to discuss such matters, (yet he would not make or give us any time or place to discuss such matters), I, instinctively turned around and said, “We love you, Archbishop”. I later wrote to him asking if he heard me. The Archbishop is a good man, a holy man but we need to find another way besides closing churches, selling nursing homes and leasing cemetery grounds to balance our budget and reach our objectives. The very people that would help you, Archbishop, are the very people you are shutting out and turning away. Isn’t that what all people want – just to be heard? So we continue. St. Joachim’s appeal was turned down by the Congregation of the Clergy. The ruling was that the Archishop did not do anything canonically wrong – he didn’t break canon law – but it was still not a right and just decision. Just this weekend, we filed an appeal with the Apostolic Signatura, the Vatican Supreme Court. I believe we will be heard. I believe we will continue to do all within our power to reopen St. Joachim Church to continue the work of our ancestors in a community that wants to be heard and wants the healing that only our Lord Jesus Christ can provide. Thank you for reading and God bless you! Put Your Faith Into Action! 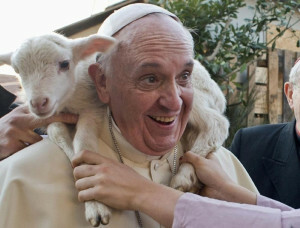 Support St. Joachim’s Beef ‘n Beer & Our Vatican Appeal! The Congregation of the Clergy has written us to inform us that they have asked Archbishop Chaput, to “obtain an elucidation of the matter and will communicate with (us) when his response has been studied”. Hopeful words to us! But we must continue our efforts. We have raised over $7500 of our expected $12,ooo cost of this appeal. We need your help and support to raise the rest of the money! We are friends; we are family! This holiday season let us join together to celebrate our faith and each other! Please join us! You can use your PayPal account/credit card to purchase tickets on our site. I donated $30.00 to purchase a ticket and all the information I needed came to via email. This works!!!!! We hope to see you on Friday, December 13th! We can’t do this without you! It just might be Peter Borre. He is our canon law consultant working with our Italian lawyers to appeal the decision in Rome to close St. Joachim Roman Catholic Church here in Frankford. Along with Mater Dolorosa, these two Churches no longer serve the Frankford community. Their loss has touched not only us but our community as well. It has been my pleasure to talk with Peter on the phone. He is caring, insightful and tireless in his efforts on behalf of those he tries to help. I’m glad he’s on our side. Here is an article from last year’s Daily News about Peter’s work and those he is helping. Titled, “National Advocate Could Be Local Parishes’ White Knight”, foreshadowed many of the current events happening in the Archdiocese. One of the Vatican’s top priorities is the “re-evangelization” of church members who have “drifted away,” he said, but the Archdiocese “is going in the wrong direction. You gotta like this guy! Today we received the acknowledgement from the Apostolic Nunciature that our “recourse for St. Joachim’s Parish in Philadelphia has been forwarded through the diplomatic pouch to the Congreation for Clergy”. You really have to love the intrigue of this! What we don’t appreciate, quite frankly, is that your voice and my voice were not involved in the Parish Pastoral Process. 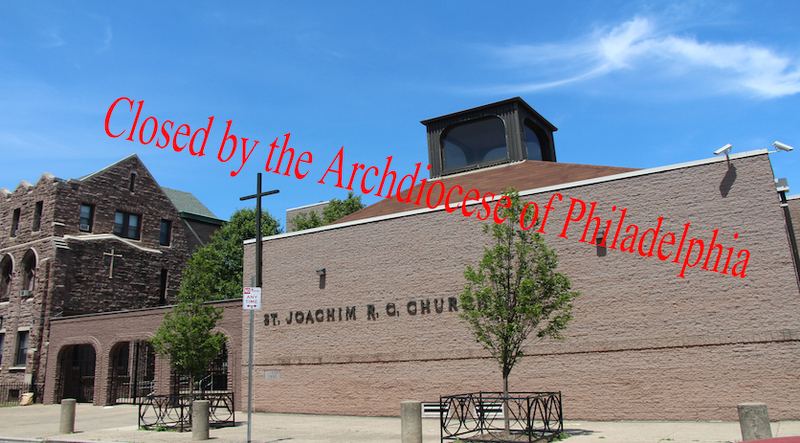 I appreciate that the hierarchy was involved, that our Pastors along with three representatives were involved but, and we must make it clear in the case of St. Joachim, “interested parishioners” did not receive information about this process along with the rest of the parishioners. We truly believed in this process and it turns out our faith was truly misguided. What makes an “interested parishioner”? Was this term used because you didn’t want to tell all of us what was going on – which took us 30 days to find out that our Pastors and representatives believed that St. Joachim parishioners and Mater Dolorosa parishioners had irreconciliable differences and would not, could not find a better solution than shuttering two viable Churces? Did anyone question that 4 people may not have been fully representative of 200-300 others in the parish? Hand picking representatives doesn’t lead to a diversity of thought but commonality of beliefs. This is the same idea that my husband and I couldn’t work as caring members of the Transition Team because of our concerns about how this process was handled and the subsequent decisions made. (For the record, we still received information and shared it with our parishioners. It’s not hard. Try it.) Who was really listening? Was this process just “lip service”? Did this give you another out to blame us for your flawed process? Did you have to be selected to be an “interested parishioner”? Each of us received a letter telling us our Churches were closing. Each of us received a letter welcoming us to the “new” old Holy Innocents. Why did each of us not receive a letter informing us of the status of this process and it’s progress. It appears that to do that would have been troublesome and opened up debate. Real debate that all “interested parishioners” could have participated in. 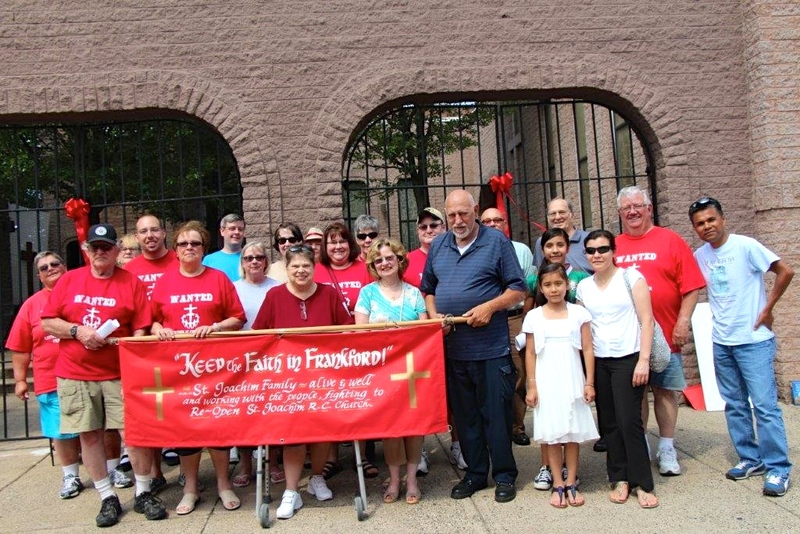 Imagine having a discussion on the future vitality of the faith in Frankford BEFORE closing two viable Churches? Well, surely we qualify as “interested parishioners” now! We would hope and pray that as this process moves forward these same mistakes and judgements are not repeated. We will be watching closely and offering other parishes the benefits of our woeful experience with this process to safeguard their Church from those more interested in their “process” than “parishioners”.